Leadership from Orange County and the City of Orlando joined the Orlando Magic’s opening night game on Oct. 26 at the Amway Center for a special dedication to those who lost their lives and those whose lives were forever changed by the June 12 tragedy at Pulse Orlando nightclub. During the pregame ceremonies, first responders were recognized on the court in a tribute to the region’s hometown heroes. Pulse nightclub survivors, employees and family members were also honored at the game where the Magic played against the Miami Heat. Orange County Mayor Teresa Jacobs, City of Orlando Mayor Buddy Dyer, City of Orlando Police Department Deputy Chief Robert Anzueto, City of Orlando Police Department Deputy Chief Orlando Rolon, Orange County Sheriff Jerry L. Demings and Orange County Fire Rescue Chief Otto Drozd III joined the ceremony in support. The Orlando Magic revealed a tribute banner with the number 49, representing the 49 victims whose lives were lost on June 12. The number 49 on the banner was filled with each of the victims’ names in remembrance of their lives. A moment of silence was then held in honor of the victims and the brave first responders who saved the lives of countless individuals that evening. 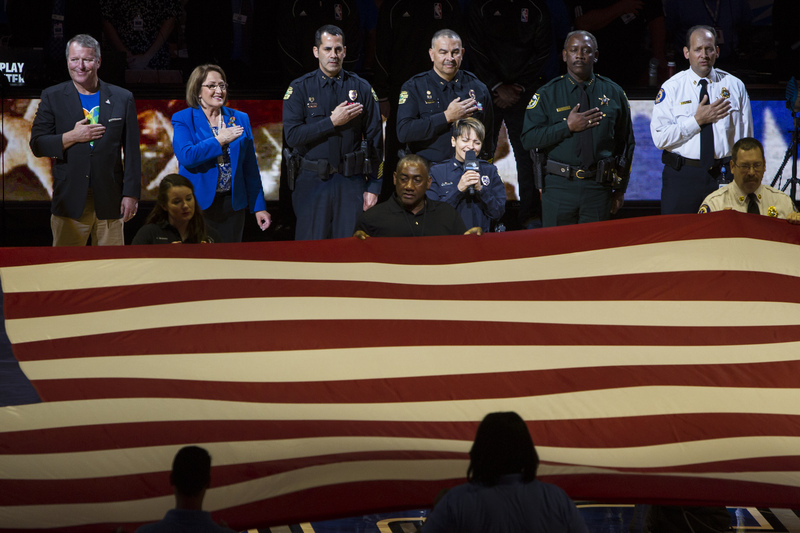 Just before tipoff, the Orlando Police Department led the national anthem as a crowd of hundreds joined in singing during the emotional moment. The pregame ceremonies highlighted the community’s unity following the tragedy. The Pulse nightclub tragedy in Orlando occurred on June 12, when a gunman killed 49 people and injured 68 others. It is considered the deadliest mass shooting by a single gunman and the deadliest incident of violence against the LGBTQ community in modern U.S. history. The Pulse tragedy is also considered the deadliest terrorist attack in the United States since the September 11 attacks in 2001. Martins serves as the head of the OneOrlando Fund board, a nonprofit created to help families impacted by the mass shooting at Pulse nightclub. The Orlando Magic and the DeVos Family Foundation together donated $500,000 to the OneOrlando Fund. Other Central Florida sports teams that paid tribute to the Pulse tragedy victims include Orlando City Soccer, Orlando Pride, Orlando Predators and Orlando Solar Bears. The teams partnered to fundraise for victims’ families and survivors through T-shirt sales benefitting the OneOrlando Fund. The Orlando Solar Bears hosted Orlando United Night on the teams’ opening night Oct. 22. The team honored first responders and remembered those impacted by the Pulse tragedy. Players wore custom Orlando United jerseys and helmets. In June at Orlando City Soccer Club’s first Orlando home game following the tragedy, the team and stadium attendees paid tribute to lives lost and featured Major League Soccer’s first-ever moment of silence during the match’s 49th minute. Tributes to Pulse Orlando victims also took place at the June 18 Orlando Pride vs. Washington Spirit match at the Maryland SoccerPlex and the June 24 Orlando Predators vs. Tampa Bay Storm game at the Amway Center. To view photos from Orlando Magic’s Opening Night Pulse Tribute, visit Mayor Jacobs’ Flickr album.